There is a famous scenario in game theory called The Prisoner’s Dilemma. In this scenario, two suspects are arrested and brought in for questioning in separate rooms. As it stands, the prosecutors don’t have enough evidence to convict the pair on the principal charges, so they really need at least one of the two to confess. They offer the suspects, who can’t communicate with each other, the following deal: if they both confess they will get each get a 3-year prison term. 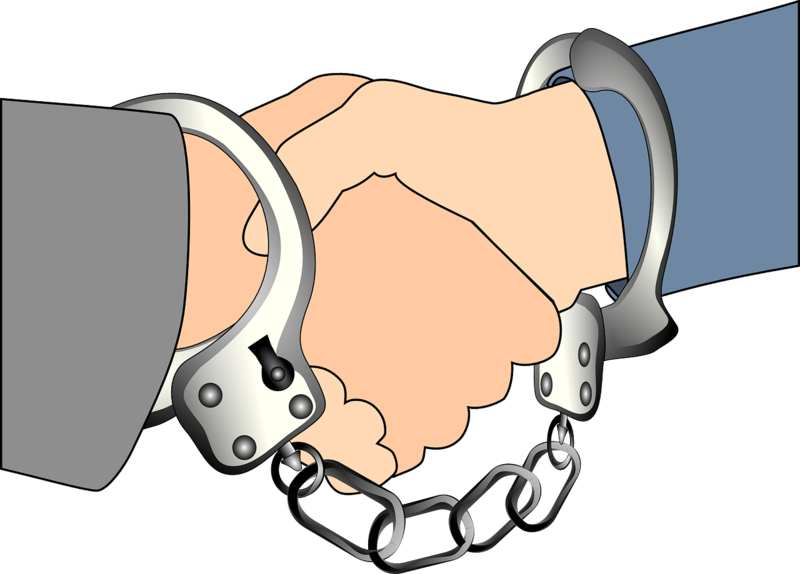 If A testifies against B, A will go free and B will go to prison for 5 years and vice-versa. If they both stay silent they will be convicted on the lesser charge and serve 2 years each. The dilemma lies in the fact that the best option for the prisoners is to both stay silent, but if the other one doesn’t, staying silent becomes the worst option, and there is no way to know in advance. In each scenario it is more advantageous for each suspect to testify, regardless of the other one’s decision. Within this context, it will seem better to each translator to accept the low rate. After all, even if they both reject the lower rate and make $0.15/word for 5 projects of 3000 words each, they would earn 3000 x 0.15 x 5 = $2,250. The potential earnings from 10 projects at the lower rate, on the other hand, would be 3000 x 0.10 x 10 = $3,000 if only one of them accepts. Again, this is an extreme oversimplification, but the sad thing is that many translators unwittingly do base their decisions on this model. Now let’s look at this scenario in a real-life context. The advantage of lower rates is illusory. In our example, taking 10 jobs at the lower rate means working 100% more hours for 30% more pay than taking 5 jobs at the higher rate. The job market is not a zero-sum game. The translation industry is expected to grow by 42% between 2010 and 2020 according to the US Bureau of Statistics, and there is enough work to keep all competent translators busy at decent rates. It’s true that there may be a drop in the number of jobs you are offered when you first raise your rates, but the response here should be to persevere in marketing yourself to a higher bracket based on the value you offer, not to buy into the notion that there are only a limited number of jobs out there and that the only way to get your share of projects is by lowering your price. This is not to say that everyone can or should charge the same rates; your exact rate will depend on whether you have a specialty, what type of clients you have, your actual skills and experience, and your marketing efforts. But there is no reason why the lowest rate should be a disrespect-inducing pittance. Also check out my blogroll over there on the right for excellent posts by my colleagues on every imaginable topic of interest to translators. These are just some places to start, but you will discover that there is an active, vibrant translation community out there for mutual support and edification. Unlike the isolated prisoners, we have enough information to conclude that it is in our best interest to reject bottom-feeder rates, regardless of what anyone else does. This is what our matrix looks like in (a closer approximation of) real life: Lest you think I’m preaching from an ivory tower and that I don’t know what it’s like out there, read my previous blog post about my journey from bottom-basement rates to sanity. Yes, it is hard in the beginning and your rates may only grow slowly over time as you gain experience and work on your qualifications; starting any business is tough and requires perseverance. But the lower you set the bar at first, the longer it will take to make a decent living. The only dilemma you really face is whether to act like a prisoner or like the free agent you really are. I believe this is the first article I’ve read applying the Prisoners’ Dilemma to translation rates; I like it! One of the problems is that you need to be confident, to have self-belief and be ready to not accept jobs for this to work, probably more of an extrovert than the stereotype of a translator; for this to be possible you typically need amongst other things: low costs, another source of income (e.g. support from a partner), savings, faith in tomorrow…otherwise the bills might add up too quickly and you crack. In any case, as you’ve mentioned a past post, if you don’t value your own work, why should clients! Thanks Duncan! And yes, all the ingredients you mention have to be there. The additional source of income, especially, is a must at the beginning, I agree, unless you’re very lucky or land an in-house job. The willingness to say no is something I had to develop, but you have to have a measure of self-belief from the beginning and determination that this is what you want to do. I love your analysis of this dilemma, Marie. And you are quite right – your second matrix is an accurate reflection of what happens when you reject low rates and decide to find higher-paying clients. It takes some perseverance, but it pays off in the end. Thank you for sharing your experience of this! Thank you Jayne, and my pleasure. One of the things I love about our profession is the mutual support and willingness of people to share with each other what has worked for them, so I’m happy to join in!